As a teacher and entertainer, Olly Ohlson was ideally positioned to bring Māori to a generation of te reo-starved New Zealanders in an accessible way. Debuting in 1980, his show After School became the first mainstream TV programme to normalise the use of Māori on a daily basis. Olly Ohlson's full name is Te Hatapihopatapui Ohlson. The son of a Norwegian immigrant and a Tūhoe woman, he was raised in the Bay of Plenty town of Te Whaiti with Māori as his first language. He was the youngest of 24 children. Press journalist Vicki Anderson summarised his many careers as follows: "Ohlson began his working life as a bushman, morphing to teacher, to insurance salesman, to parish worker, to television, to counselling, to tutor, to running a successful behavioural change programme in prison." As Olly Ohlson, he became a household name in New Zealand as the face of afternoon children's show After School. Appearing on weekdays for six years during the 1980s, Ohlson broke new ground in his use of te reo Māori and sign language — one time, he even presented a te reo version of Mastermind on the slot. In 1982, he won the Best New Talent award at the Feltex Television Awards. His fame was such that comedian Billy T James imitated him in the second season of his comedy show. Ohlson spent seven years as a teacher before his first stint in television. In the late 70s he appeared in a trio of children's programmes shot down south: Cgull, Woolly Manor and Woolly Hills. His co-stars were Annie Whittle, Kevin Wilson and Endel Lust. Ohlson describes his role as the "happy-go-lucky, guitar-playing Māori guy". Ohlson then went into selling insurance, before becoming a parish worker with the Baptist Anglican Church in Timaru. It was then that Ohlson was rediscovered by TVNZ and asked to audition as a children's presenter. During the early 1980s, some in the Māori community were expressing their annoyance at how little Māori culture and language got on television. TVNZ was pressured to make changes. Ohlson was given the brief to boost the use of te reo Māori on After School. As researcher and writer of his own scripts, he had considerable freedom to shape the programme's content. Ohlson mixed Māori, English and sign language into his delivery, and signed off each day's episode with a mixture of all three, including the words "Keep cool, till after school' and "Hei kone ra". The key to his natural on-air delivery lay in Ohlson pretending he was talking to his two daughters. "I wanted the kids to think I was talking to them as individuals," he said later, "not just 'to you guys out there'." Ohlson encouraged viewers to research the history of local streets and landmarks, "so they might found out a bit about their Māori history". The show was flooded with mail; later, after the creation of a special slot called Kupe, extra production staff were brought on to deal with all the feedback and artwork. He also hosted parenting show You and Your Child. Ohlson left After School at the end of 1986, after a change of producer. The show was finally cancelled in 1989, by now with Jason Gunn at the helm. Away from broadcasting, Ohlson has had a long career in teaching te reo and Tikanga Māori. He has been visiting prisons since the 1960s, and later created Mauri Hauora, a programme designed to use indigenous teachings to bring positive change for Māori prisoners. Ohlson has also worked as a counsellor, specialising in Māori clients, with the Family Court. 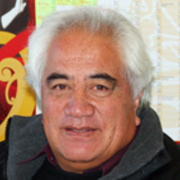 Te Hatapihopatapui Ohlson has worked as an educator and policy adviser at tertiary level for many years. He taught for five years at Te Wananga o Aotearoa in Christchurch, where he launched a key Tikanga Māori course. He has also spent time as kaumatua at a counselling service provider for women and families.